The Bag Boy Express DLX Pro pull cart features Top Lok technology, a patented bag-to-cart attachment system that eliminates the need for cart straps. It is designed to securely lock the bag onto the push cart, preventing it from twisting or turning. 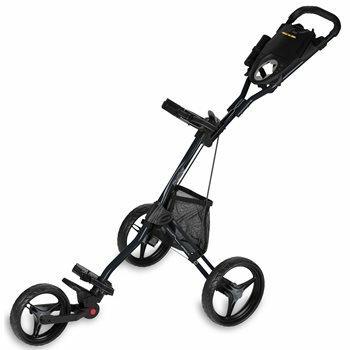 The Express DLX Pro pull cart also features a simple two-step folding system with a fold under front wheel; a newly designed front wheel assembly; a push on and off foot brake system for hands-free stopping and the ability to store a golf bag on the cart even when it’s folded. The pull cart is lightweight at 12.7 pounds and is equipped with an oversized mesh storage basket; a new integrated umbrella storage with loop and storage notch; and a full-feature, extra deep scorecard console that includes a beverage holder, mobile device holder and golf ball storage. Review by patsoxfan, 7 months ago. This cart can be used with a woman's bag.